Cons: It unfolds rapidly when removed from the storage bag which can be a safety hazard. There is a gap between the padding and bedding so you need to be cautious. It is hard to dissemble initially. The KidCo Peapod Plus Infant Travel Bed is a convenient travel crib or outdoor enclosure designed for kids aged one to five years of age. Weighing about 3.65lbs, this portable bed for kids measures 52.5”L 34”Wx25”H in open position and can be folded quickly for storage insides its own bag measuring 19” L x 3.5” W x 19” H in size. This crib passes all the essential ASTM and Federal standards and is one of the cheapest travel cribs on the market. Parents who travel a lot with their toddler and are looking for a portable bedroom that can provide the child a comfortable place to sleep or play. The KidCo Peapod Plus comes fully assembled and features anchor straps that helps keep the bed secured to the ground when used outdoors. Featuring a micro – lite detachable sleeping pad for easy cleaning or packing, this travel bed for toddlers is also equipped with two extra large front zipper panels that allow parents to have quick access to their infants or toddlers from any angle and also provide an easy in and out for older kids. In our Kidco Peapod Plus reviews, we found that it can be difficult to dissemble the first few times, but it does become very quick with practice. In fact, once you are used to disassembling it, it is the fastest travel crib to put away. The KidCo Peapod Travel Bed is lightweight and fits easily in your luggage without any issues, making is an ideal option for both long trips or short visits. We fit it into the top of our suitcase without a problem. It can become your little one’s own portable bedroom very easily. The Peapod sleeping pad that is attached to the underside of the crib helps protect that kids from the damp, cold floors and provide them a comfortable place to sleep. However, it is quite thin. In addition, this infant travel bed equipped with adjustable window screens that can helps parents allow or block light to help their little one sleep comfortably inside the Peapod. We did find in hot weather that our child did get quite sweaty inside and we needed to clean it regularly. It can be used for kids aged one to five years. The KidCo Peapod includes UV protection to protect your kid from the harsh rays of the sun. The light weight mesh surround not only helps promote proper air flow, but also acts as an insect screen and protects your kid from insect sting and bites. It is hard to keep a sheet in place and this could be a hazard for young infants. As always, ensure you follow safe sleeping guidelines when using this crib. It unfolds rapidly when it is removed from its bag, so it’s important that it is not removed near any children as this could be a hazard. The KidCo Peapod Plus Infant Travel Bed can fit in carry-on luggage. Material specifications: mattress fabric 100 % polyester, Mattress fill 100% polyester, mesh 100% polyester. All fabric and mesh elements are fire retardant and UV coated. It comes with a handy travel case. It comes with a one year limited manufacturer warranty. It comes in a range of colours including kiwi, cranberry, twilight and yellow. There are many optional extras, such as purchasing the KidCo Peapod Plus Infant Travel Bed with a happy face night light or an on the go night light. 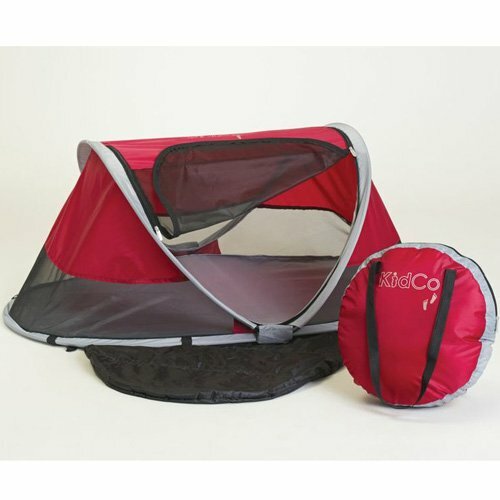 It is also possible to buy a KidCo PeaPod Plus Travel Bed with Snack & Play Travel Tray. There is also a KidCo PeaPod for younger kids. Click here to see it. The infant bed can only be used only with the sleeping pad that is provided with the manufacturer. Difficulty using sheets in the crib. The KidCo Peapod Plus Infant Travel Bed is a great choice for families with toddlers that want a cheap and lightweight travel crib that takes up minimal space. It has worked very well for our family and the kids don’t just like sleeping in it, but also having a cubby house to play in. Still unsure which travel crib to buy? Check out our buying guide.